ABC and ABC News 24 reached 4 million viewers in metro and regional markets across its New Year’s Eve 2014 coverage from 8:30pm last night, up from 3.7 million last year. In Sydney, more than 1 in 4 tuned into ABC TV during the coverage. The combined metro and regional audience for ABC TV’s New Year’s Eve: Welcome (20:30-20:55) was 782,000 on ABC. The combined metro and regional audience for ABC TV’s New Year’s Eve: 9pm Family Fireworks (20:55-21:10) was 1.4 million on ABC and ABC News 24. The combined metro and regional audience for ABC TV’s New Year’s Eve: Party (21:10-23:55) was 1 million on ABC. The combined metro and regional audience for ABC TV’s New Year’s Eve: Midnight Fireworks (23:55-00:22) was 2 million on ABC and ABC News 24. Last night, ABC was the leading channel in the metro markets with a 5 city prime-time share of 19.7%. ABC TV’s New Year’s Eve: Midnight Fireworks was the No.1 program of the night with a 5 city audience of 1.4 million followed by the 9pm Family Fireworks with an audience of 1 million. In Sydney, ABC also achieved a share of 27.9%. Justin Holdforth, ABC Head of Sport and Events says: “The Sydney New Year’s Eve fireworks are an iconic and much loved event. I’m delighted that the ABC was again able to deliver a spectacular night of family entertainment to audiences across Australia”. Source: OzTAM & RegionalTAM overnight data. Reach is based on 5 minutes consecutive viewing. A brilliant light bulb illuminated Sydney Harbour last night as huge crowds gathered around the foreshore to welcome in 2015, while millions more watched around the world. Celebrating the International Year of Light, the 12-storey-high Sydney Harbour Bridge Effect was the centrepiece of the Midnight Fireworks display – one of the largest and most technologically advanced fireworks displays in the world. The light bulb design, which remained top-secret until midnight, followed an animated image of the New Holland Seahorse, which appeared on the Bridge during the 9PM Family Fireworks. The New Holland Seahorse – commonly known as the Sydney Seahorse – is native to Sydney Harbour. Lord Mayor Clover Moore said Sydney’s world-famous fireworks displays provided the perfect welcome to the New Year. “Sydney is known as the New Year’s Eve Capital of the World and last night’s celebrations were no exception,” the Lord Mayor said. 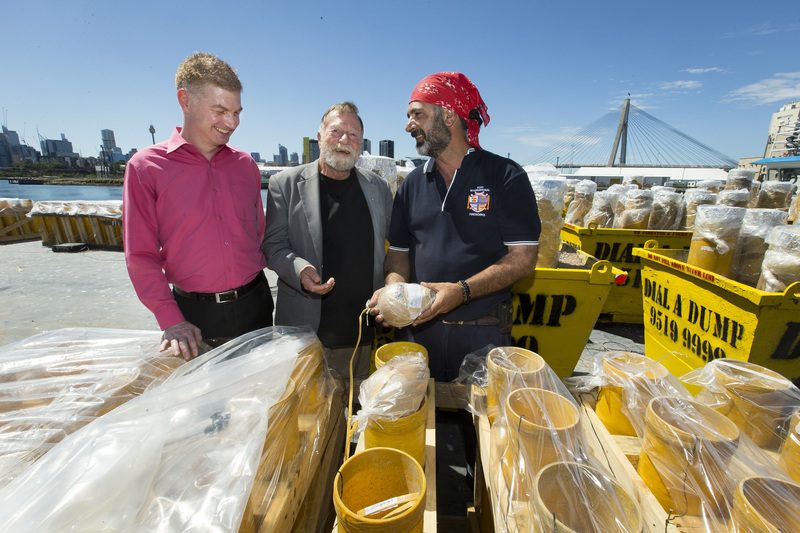 Sydney NYE2014 – ‘Inspire’ Producer Aneurin Coffey, Sydney NYE2014 – ‘Inspire’ Creative Ambassador Jack Thompson and Sydney NYE2014 – ‘Inspire’ Fireworks Director Fortunato Foti discussing fireworks at White Bay. Master pyrotechnician Fortunato Foti of Foti International Fireworks was responsible for the fireworks displays for the 14th consecutive year. The displays used approximately 7 tonnes of fireworks, including 11,000 shells, 25,000 shooting comets and 100,000 individual pyrotechnic effects. The Lord Mayor praised the City of Sydney crews who worked throughout the night to ensure Sydney was sparkling this morning. “With huge crowds gathering around the harbour foreshore and at vantage points across Sydney, the clean-up of New Year’s Eve is an enormous task,” the Lord Mayor said. The $290,000 clean-up operation involved the use of 60 trucks, sweepers and compactors and 600 mobile garbage bins to support the City’s 720 street litter bins, which were filled with plastic bottles, food containers and food scraps. 90% of the waste collected will be recycled courtesy of SITA Australia. The Lord Mayor also thanked everyone who made the event possible, including the City’s Sydney New Year’s Eve team and Creative Ambassador Jack Thompson. “After more than 15 months of planning, it was wonderful to see Sydney at its best last night, as the 1st major global city in the world to ring in 2015,” the Lord Mayor said. Sydney New Year’s Eve 2014 – ‘Inspire’ acknowledges the support of Leadership Partner – Telstra, Charity Partner – Engineers Without Borders Australia & NSW Government agencies and landholders including the Sydney Harbour Foreshore Authority and the Sydney Opera House Trust. Spectacular aerial footage from inside tonight’s Midnight Fireworks display will be captured by drones and broadcast live for the 1st time anywhere in the world. The drones will fly up to 1,000 feet above Sydney Harbour, recording high-resolution footage of the fireworks as they launch from the Sydney Harbour Bridge, the Sydney Opera House and barges on the water. Live footage from 2 drones will feature in the ABC’s TV broadcast and Sydney NYE Telstra YouTube Show. A 3rd specially-built drone equipped with six cameras will capture amazing 360-degree views of the fireworks that audiences can view after the event via the Sydney NYE Telstra App. Lord Mayor Clover Moore said the celebrations to welcome in 2015 were shaping up to be Sydney’s best yet. “Our Sydney New Year’s Eve team and pyrotechnic experts are busy putting the finishing touches on tonight’s displays, and I can’t wait to see what they have in store for us,” the Lord Mayor said. The 9PM Family Fireworks and Midnight Fireworks displays will feature 7 tonnes of fireworks, including 11,000 shells, 25,000 shooting comets and more than 100,000 individual pyrotechnic effects. More than 1.6 million people are expected to line the harbour foreshore to view the displays, which are recognised as one of the largest and most technologically advanced in the world. The centrepiece of tonight’s displays will be the Sydney Harbour Bridge Effect – the top-secret, 12 storey high LED design that will be revealed at midnight. The Bridge Effect ties into this year’s Sydney New Year’s Eve theme, Inspire. After debuting tonight, it will continue to shine brightly above the harbour from 8pm to midnight on Thursday and Friday night. Pre-Show Entertainment will begin at 6pm when former fighter pilot Matt Hall performs daring aerial displays above the harbour. At 7pm, tug boats will blast tonnes of water into the sky from Millers Point to Fort Denison and back again. Following the 9PM Family Fireworks, the Harbour of Light Parade will see more than 50 illuminated boats carry over 8,000 people on a majestic passage around Sydney Harbour. A 3rd mini-fireworks display, known as the ‘Inspire moment’, will also feature at 10:40pm to keep crowds entertained during the countdown to midnight. Audiences around the harbour and at home are being encouraged to become part of the celebration by using the hashtag #SydNYE to tweet messages about how Sydney will inspire them in the New Year. The tweets will appear live on the Sydney Harbour Bridge Pylons throughout the night, and will be seen by millions of people across Australia and more than a billion worldwide. For up-to-the-minute information on tonight’s celebrations, follow the hashtag #SydNYE and @cityofsydney on Twitter. Tug boats blast tonnes of water into the sky from Millers Point to Fort Denison and back again. Projections will come to life on the pylon’s surfaces after sunset and huge images will be projected throughout the night. A ceremony that reflects a respect for Aboriginal and Torres Strait Islander culture and honours the relationship between traditional custodians and the land. The Sydney Harbour Bridge lights up in a design that features over 13 kilometres of spectacular LED rope lighting. An 8-minute fireworks display at a family-friendly time, complete with a soundtrack appealing to young children. Features more than 50 illuminated boats that carry over 8,000 people on a majestic passage within and around Sydney Harbour. An inspirational mini-fireworks display to keep crowds entertained during the countdown to midnight. A show-stopping grand finale display on the Sydney Harbour Bridge, Sydney Opera House, barges along the harbour and city buildings. One of Australia’s most popular DJ’s, Nina Las Vegas, is serving as musical director for the Sydney New Year’s Eve 2014 – ‘Inspire’ fireworks displays. Nina, who currently hosts triple j’s Mix Up Exclusives, has created 2 spectacular soundtracks that will be synchronised to the 9PM Family Fireworks and Midnight Fireworks displays. The 9pm Family Fireworks soundtrack will feature a family-friendly mix of pop songs and tracks from recent children’s films, while the Midnight Fireworks display includes some of Nina’s favourite dance tunes from the past year, along with pop hits and well-known rock anthems. The soundtracks will be broadcast live on 104.1 2DayFM at 9pm and Midnight. Lord Mayor Clover Moore said the Sydney New Year’s Eve soundtracks play a special role in bringing the celebrations to life. “Sydney Harbour provides a stunning backdrop for the world’s most famous fireworks displays and each year, the fireworks soundtracks makes the celebration even more exciting,” the Lord Mayor said. Nina Las Vegas is known across Australia for her encyclopaedic knowledge of dance music and strong support for the local music scene. Nina has worked in Australian radio for over a decade, along the way establishing herself as one of Australia’s premier dance music DJ’s. She has appeared at music festivals including Splendour in the Grass and Stereosonic, and played shows with Pharrell Williams, MIA and Baauer. “Sydney New Year’s Eve is such an iconic event, so I was thrilled to be asked to be involved. It’s one of those rare moments when the whole city comes together and the eyes of the world are on Sydney,” Nina said. Sydney-born boy band 5 Seconds of Summer’s Amnesia, which went platinum on the ARIA charts this year. 12 computers are used to synchronise the fireworks to the fireworks soundtracks and ensure the displays go off together seamlessly. For more information, visit sydneynewyearseve.com. Sydney New Year’s Eve 2014 – ‘Inspire’ acknowledges the support of Leadership Partner – Telstra, Charity Partner – Engineers Without Borders Australia, & NSW Government agencies and landholders including the Sydney Harbour Foreshore Authority and the Sydney Opera House Trust. The City of Sydney’s New Year’s Eve fireworks display is recognised as one of the world’s largest and most technologically advanced New Year’s Eve fireworks displays. The 9pm Family Fireworks and Midnight Fireworks displays are watched by 1.6 million people on Sydney Harbour, millions across Australia and more than a billion worldwide. Sydney’s celebrations draw larger crowds than New York City (1 million), Berlin (1 million), London (700,000) and Paris (100,000). The fireworks are designed by Foti International Fireworks, led by Fireworks Director Fortunato Foti, and require a pyrotechnic crew of 45 people. This is the 17th consecutive year the company has been involved in Sydney New Year’s Eve. Approximately 11,000 shells, 25,000 shooting comets and 100,000 individual pyrotechnic effects will be used in the display, which is made up of 7 tonnes of fireworks. 14 shipping containers of equipment, weighing 120 tonnes, are needed for both the 9pm Family Fireworks and Midnight Fireworks displays. 12 computers will digitally launch the fireworks from the Sydney Harbour Bridge, barges and buildings, shooting 10,000 cues. The computers will be used to fire the show and will ensure the fireworks are synchronised to the music. More than 60 kilometres of wire and cables link the launch computers, and there are 130 firing points on the Sydney Harbour Bridge. The 9pm Family Fireworks will go off from 4 fireworks barges, while the Midnight Fireworks will launch from 7 barges, jet-skis, the Sydney Harbour Bridge and the Sydney Opera House. Each year the top-secret Sydney Harbour Bridge Effect is a highly anticipated part of the night and is only revealed at the end of the Midnight Fireworks display. The Effect has been a highlight since the mid-1990’s when a smiley face appeared on the Bridge. This year, the Bridge Effect will be made from more than 13 kilometres of LED ropelight, and measure 12 storeys high. Previous Bridge Effects have included the word ‘PEACE’ and a dove (2002), 3 concentric hearts (2005), a mandala (2007) and an all-seeing eye (2013). The Harbour of Light Parade® features more than 50 illuminated boats, which make a majestic passage within and around the Sydney Harbour Exclusion Zone after the 9pm Family Fireworks, building up excitement before the countdown to midnight. The boats carry over 8,000 people and join more than 3,000 other vessels celebrating New Year’s Eve on Sydney Harbour. Stephen Hall was referred to with great fondness as ‘Festival Hall’, a statement of his extraordinary reign, leading Sydney Festival for 18 consecutive years. It was under his guidance that Sydney Festival flourished from a small community celebration to a unique blend of international theatre, music and dance – sitting alongside food festivals, a ferry race and major free outdoor concerts. It was Hall and his team of event professionals that directed the Special NSW Bicentennial Events including Australia Day ’88. He was also key to the instigation of the world famous Sydney New Year’s Eve fireworks on Sydney Harbour. Stephen showed enormous commitment to local Australian art companies and artists. He made key contributions to the Sydney Writers Festival, Sydney Dance Company and the Australian Brandenburg Orchestra while also programming momentous local theatre such as Bran Nue Dae and Faces In The Street.